1989 - Katts and Dog（英语：Katts and Dog） 集數："Mistaken Identity"
1992 - The Ray Bradbury Theater（英语：The Ray Bradbury Theater） Charlie 集數："Colonel Stonesteel and the Desperate Empties"
1997 - Flash Forward（英语：Flash Forward） Gord 集數："Mudpack"
- Fast Track Young Chandler 集數："Combustions"
1999 - Deep in the City Tyler 集數："Departures"
- Real Kids, Real Adventures Aaron Hall 集數："Mountain Lion"
2000 泰星來客 Earth: Final Conflict Max 集數："Sanctuary"
- The Famous Jett Jackson（英语：The Famous Jett Jackson） Chet 集數："What You Wish For"
- The Outer Limits（英语：The Outer Limits (1995 TV series)） Morris Shottwell 集數："Lion's Den"
2002–04 超人前傳 Smallville Eric Summers 集數："Leech", "Asylum"
2009–2010 Q版大英雄 The Super Hero Squad Show 冰人 配音；集數："Mysterious Mayhem at Mutant High! "，"The Ice Melt Cometh!" 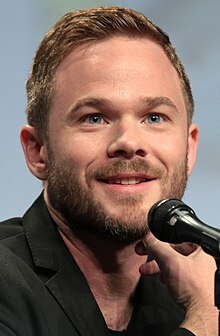 F檔案 Fringe Joshua Rose 集數："Amber 31422"
^ Shawn Ashmore. TV Guide. [2009-09-23]. ^ Shawn Ashmore is married. People. 2012-08-29 [2013-02-05].